If you’re a homesteader, you no doubt know the difficulty of storing vegetables, fruits, and meats over the winter months. It’s nearly impossible to grow any sort of produce during cold weather in most states, so it’s necessary to find alternative methods for storing the foods harvested in the early fall. While freezing is a great option for many homesteaders, frozen foods take up quite a bit of space and, of course, require electricity. 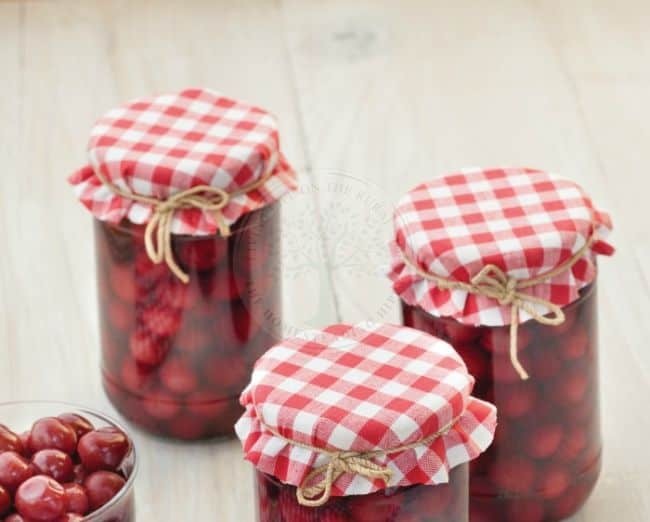 Canning food is a quick and easy alternative that takes up minimal space and requires zero utilities. There are two types of canners available: water bath and pressure canners. While water-bath canners are significantly less expensive and easier to run than pressure canners, it should be noted that many foods cannot be canned via water bath systems. Water-bath canning involves processing your canned foods in boiling water for a certain amount of time, while pressure canning heats your food under steam pressure. This allows for substantially higher temperatures. Low-acid foods, including most vegetables and meats, cannot be canned using a water-bath system, as they must reach a higher temperature in order to eliminate the risk of contracting food-borne illnesses, such as botulism. 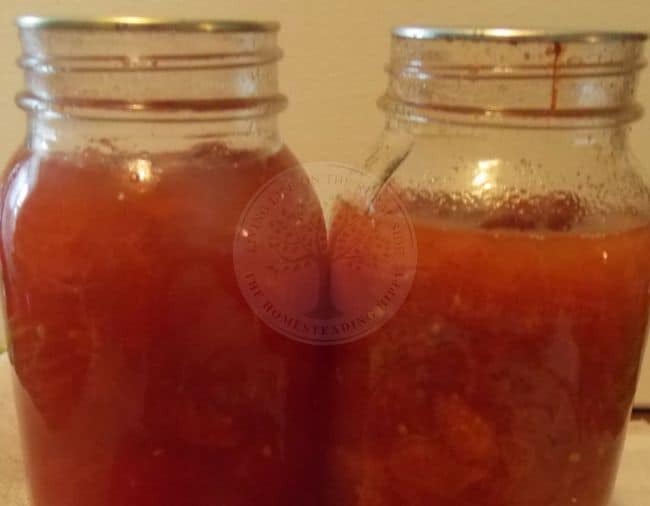 However, high-acid foods, such as fruits, jams, tomatoes, pickles, and chutneys, can easily be canned with a water-bath system. So what are the easiest foods to can? 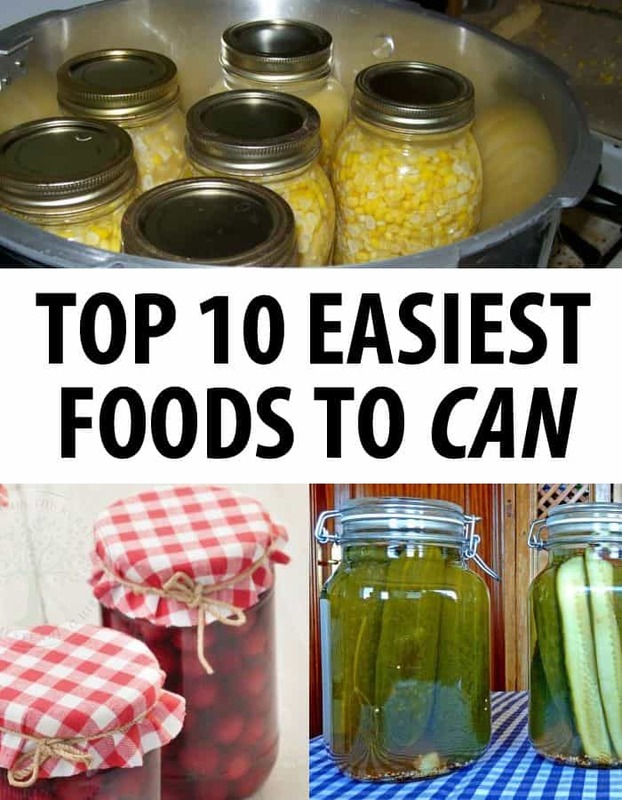 While this may vary depending on your canning system and preferences (and especially the type of canner you prefer to use), there are countless of vegetables, meats, and fruits that are simple to can and store for long periods of time. However, these are some of the most popular options. Tomatoes can easily be canned in a water-bath canner, as long as you add extra lemon juice to increase the acidity of the mixture. To can, simply blanch them quickly in hot water, peel, and core. Then, stuff them into jars, add two tablespoons of lemon juice and a teaspoon of salt, cover with new seals and rings, and then boil in your water bath system for roughly forty-five minutes. Most people prefer to can cucumbers as dill or sweet and sour (also known as bread and butter) pickles. Pickles allow you to maintain the crunchiness of cucumbers throughout the cold winter months of storage. The best cucumbers to use for canning are classic pickling cucumbers. These grow to a smaller size and maintain their firmness while they grow. You can also use full-size cucumbers and slice them down to the appropriate size. After washing and slicing your cucumbers (if needed), add dill, vinegar, red pepper flakes, some cloves of garlic, mustard seed, celery seed, pickling salt, and coriander. You can also experiment with other spices to get the perfect mix for your family. Just remember that pickles tend to grow more potent the longer they sit in storage, so you may end up with a tangy brew after a few months in the cellar! 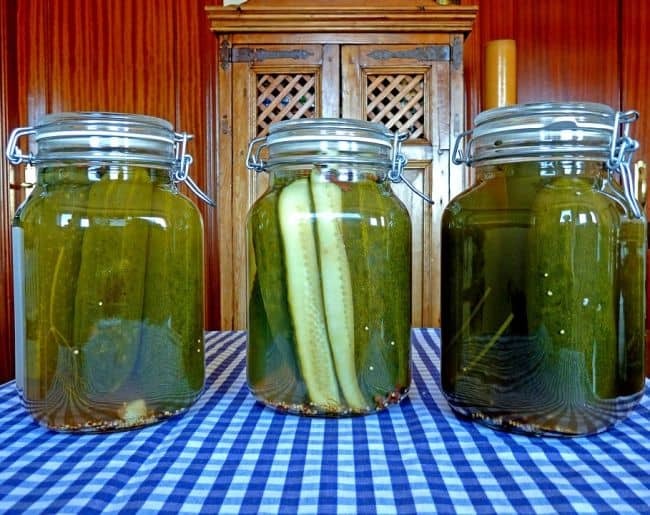 After preparing and covering your jars, you only need to process your pickles in a water bath canner for five minutes. The longer you boil, the softer they become, so be sure not to overcook them. Beans can be canned, but must be done using a pressure-canner, as they have low acidity. Take about two pounds of green beans and pack them tightly into canning jars. 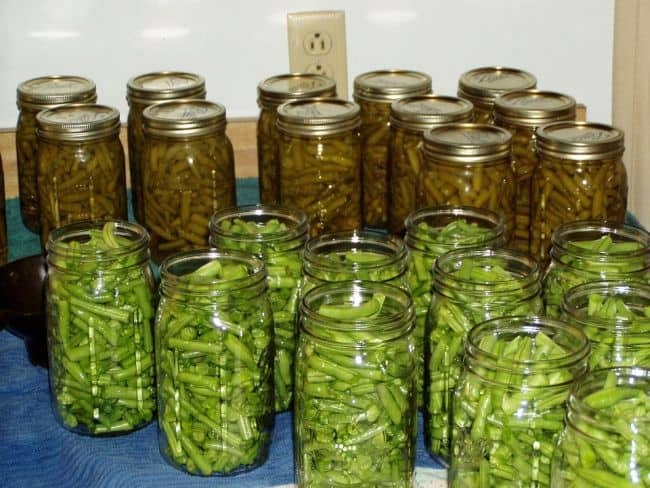 Many people blanch their green beans before canning, but this is not mandatory. Add water and salt to the jars (this is optional, but helps preserve flavor). You must process a minimum of two quart jars or four pint jars in a pressure canner at a time to ensure safe processing. Then, can the jars at ten pounds pressure for twenty minutes (if canning pints) or twenty-five minutes (if canning quarts). You can also can dried beans, by the way. Canned corn is a great option to preserve your harvest, as it maintains similar flavor as the fresh-off-the-cob variety. Corn must also be canned in a pressure canner. 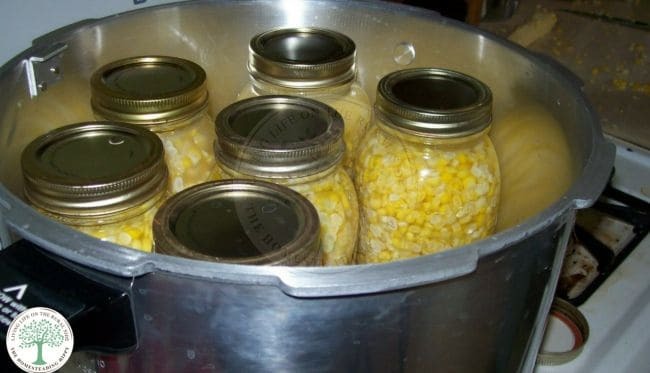 Roughly thirty pounds of corn is needed for a full canner load of seven quarts. Blanch corn for two minutes in boiling water. Then, cool it immediately in a bath of ice water. Cut the corn off the cob and then pack your jars, leaving an inch or so of head space. You can also add salt, if desired. Leave the jars in the pressure canner for an hour and twenty five minutes for quarts, or fifty-five minutes for pints. This is a long time compared to other vegetables, but absolutely worth it. If you own chickens or beef cows, canning extra stock after butchering is a great way to make full use of an animal carcass. Plus, nothing beats chicken stock as a substitute for bouillon cubes or water to spice up a boring recipe! To make stock, you need a three to four pound chicken, an equivalent amount of beef on the bone, or several leftover carcasses. You also need sixteen cups of water, some spices (such as peppercorns, salt, and bay leaves), and vegetables (optional). You can either boil your carcasses down overnight in a slow cooker, or put them on the stove in a large sauce pot. Simmer for two to three hours, or until the chicken or other meat is tender. Strain the stock throw a sieve to allow the fat to solidify and separate. Then, heat the stock back up and ladle it into jars, leaving about an inch of head space. Process the jars at ten pounds pressure for twenty minutes (pints) or twenty-five minutes (quarts). Fruit can easily be canned in a water bath canner. Harvest your fruits early in the morning, when they are their freshest. Wash them carefully, then pack raw fruit into jars. Cover them with boiling hot water or sugar syrup, leaving a headspace of about half an inch deep. Most fruits only require about ten minutes in a water-bath canner. Both plain pumpkin and winter squash can be canned. This takes up much less space in your freezer, and provides a quick addition for pies and side dishes. Generally, for each quart jar of canned squash, you will need about two pounds of fresh, unpeeled squash. Wash, peel, and blanch your squash, then pack into canning jars. Squash must be canned using a pressure canner at ten lbs. for fifty-five minutes (pints). While canned greens, such as spinach and collard greens, won’t taste as fresh and crispy as the newly harvested varieties, they will store nicely for use in soups, pastas, and side dishes. These may be canned with or without salt, and must be canned at 10 PSI. You will need about twenty-eight pounds of greens for a full canner load of seven quarts. Only can fresh greens, as those that are diseased or wilted will lower the quality of your canned goods. You will need to process these for seventy to ninety minutes, depending on whether you are processing pints or quarts. Although canned asparagus has a softer, milder taste and texture than fresh asparagus, it is delicious in soup or when added to omelets or pastas. Canned asparagus lasts indefinitely but does need to be canned using a pressure canner. Don’t can the base of the asparagus plants (the part on the opposite end of the scaly leaves and pointed tip). This is too tough to can and will not be tender when it’s done. You should add salt, if desired, and water to your canning jars, then process at forty pounds pressure for forty minutes. If you’re pressed for time, you can cut your asparagus spears shorter, making less work for the canner. Carrots are a homesteaders favorite for canning, as they taste deliciously sweet and tender after coming out of a can and there is no difference between canned and regular cooked carrots. These are great as a side dish or an addition to a stew or soup. Furthermore, carrots are a great food to can because they are ready later in the season than most of your other canning vegetables. If you find yourself becoming overwhelmed by a lengthy autumn to-do list, you can breathe easy knowing that carrots can wait until November or December. Carrots should be washed and peeled, then packed raw into hot jars. Add salt, if desired, and boiling water. You can add a sweet syrup if you choose, or leave them plain for more versatility. They should be processed at ten PSI for twenty five to thirty minutes. Canning is a wonderful hobby that also helps you fill your pantry for the cold winter months ahead. Many homesteaders shy away from the endeavor, thinking it too complicated or involved. However, with a few basic pieces of information and a small amount of know-how, it’s easy to can delicious vegetables, fruits, and meats for use all year long.